Do you remember the last time you had a warm, fresh from the oven, mozzarella margherita pizza? The cheese is all melty, warm and stretchy? 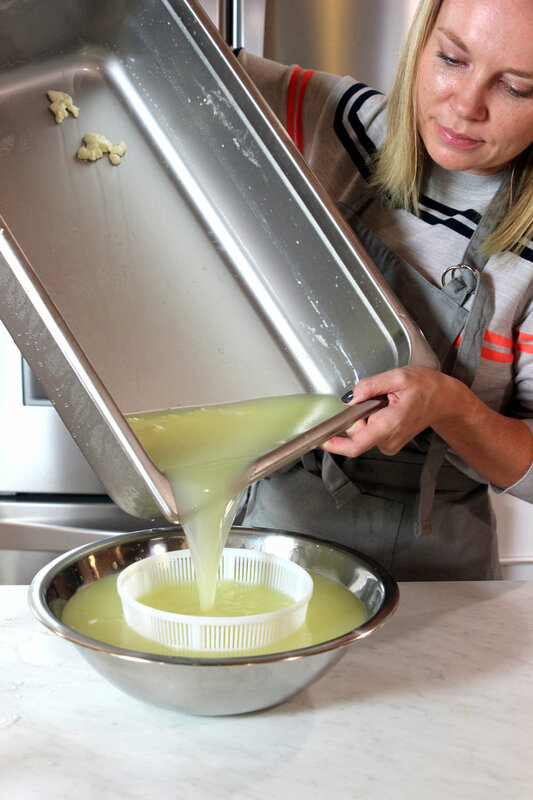 Now, this may be a dangerous secret to let you in on but you can make that cheese in less than 30 minutes at home. It’s a pretty epic party trick (“I made it myself!”) and the cheese truly is better than anything you’ll buy in the grocery store. That freshness makes all the difference. Prep: Dissolve the 1 ½ tsp of citric acid into 1 cup of water. Set aside. Step one: Pour the milk into the pot. Stir in the prepared citric acid solution. Step two: Heat the milk to 90 degrees, stirring frequently. Warm milk on low for an even, gentle heating process. Step three: While the milk is heating, dissolve the rennet into ¼ cup water. The rennet sort of suspends and crumbles more than it dissolves. You need to use real rennet and not junket rennet (which is used for custards). Junket rennet is too weak to make this into cheese. Buuuuut, if the only thing you have is junket rennet, you can make a soft form of mozzarella if you quadruple the rennet amount. Step four: Once milk reaches 90 degrees, turn off heat. Stir in the rennet solution. Count to 40 seconds while gently stirring in the rennet. Step five: Once rennet is fully stirred in, stop stirring, cover the pot and let it sit for five minutes. Step six: At this point, the curds should be set enough to cut. They should hold a cut. If they don’t, cover the pot and let sit for another 5 to 10 minutes until the curds stay solid. 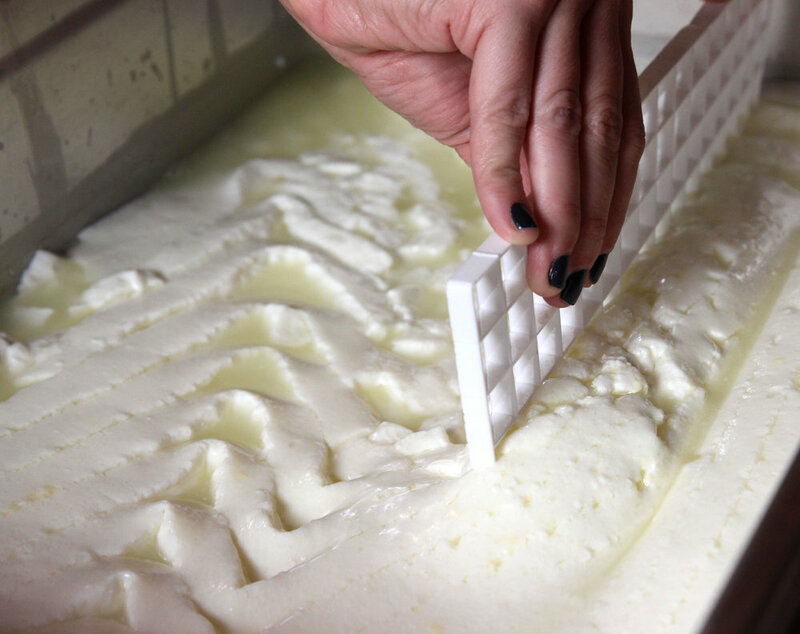 Cut the curds vertically into 1” squares, and then horizontally in 1” squares. You’re trying to create a gridlike pattern. Step seven: Cooking the curds is used to help separate the curd from the whey (whey is the liquid left over after all of the proteins in the milk have coagulated into cheese). Heat the curds slowly to 105 degrees and stir gently so the curds don’t break up. Step eight: Once the curds have reached 105 degrees, turn heat off and stir gently for five minutes. 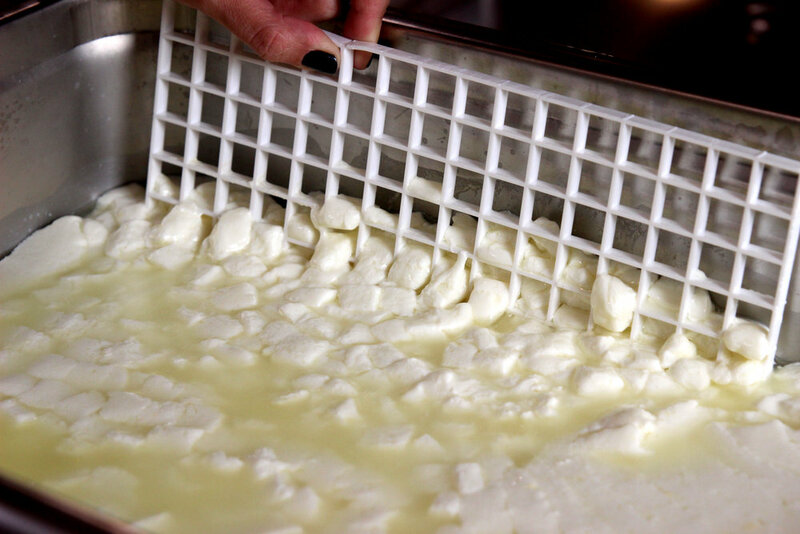 Step nine: Using the slotted ladle, move the curds into a microwave-safe bowl, leaving the whey in the pan. Step ten: Add 1 tsp of salt into 16 ounces the leftover whey. Dissolve the salt. Put the whey in the freezer for rapid cooling. Put in 2 ounces of ice cubes for extra super duper fast cooling. 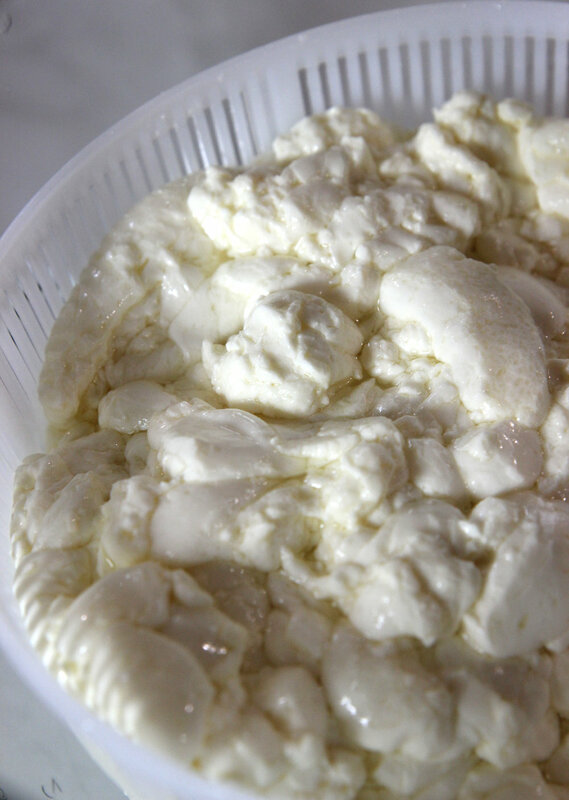 Step eleven: Microwave the curds in one minute increments, draining the whey off until the curds reach 135 degrees. Step twelve: Put your gloves on (135 is hot!) and stretch the curds. This is the time to salt the cheese. Keep folding the curds and stretching. When the cheese is shiny and smooth, it is ready to shape. You can shape it into a log or into balls. If you overwork the mozzarella and it gets brittle and start to break, you can reheat it in the microwave. Step thirteen: Immediately after shaping, cool the mozzarella by putting it into the cooled salted whey bath. Type of milk – I like to use regular full fat cow’s milk. Some people even add a tinch of cream for an even richer batch (4 to 8 ounces of cream for every gallon of milk). It’s plenty rich without that extra cream. What to do with the whey – You can bake with it or make ricotta with it.